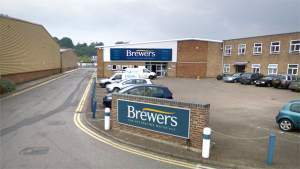 The Royal Tunbridge Wells Brewers Decorator Centre is a large, open showroom with an extensive choice of curtains and blinds, wallcoverings and fabrics. There’s also a full range of designer, trade and specialist paints to choose from. We have protective coatings expertise and can arrange local site visits to give advice on products for particular applications and projects. With more than 100 years’ experience within our team, you won’t find better paint and decorating advice in the town or for some miles around. You’ll find our store on the High Brooms Industrial Estate on Chapman Way, just off North Farm Road, 100 metres or so further north of High Brooms railway station. There’s a large customer car park and safe access for anyone with limited mobility. We can also arrange for local deliveries where appropriate. From Sandhurst Road, go under the railway bridge and at the mini roundabout, take the third exit on to North Farm Road. Continue on and take the fifth turning on on the left to Chapman Way. Take the first right. From Upper Grosvenor Road, continue on until you reach the mini roundabout and take the second exit on to North Farm Road. Continue on and take the fifth turning on on the left to Chapman Way. Take the first right. Turn right off of Chapman Way and continue on to see the store on the left.